A barrel is a short, solid connector which is basically two connectors joined together. Barrels are used to connect two cables which do not have compatible connections. The first example pictured on the right is a female BNC barrel, i.e. it has two female connectors. This allows two cables with males connectors to be joined together. The second example shows a female BNC to male RCA barrel. 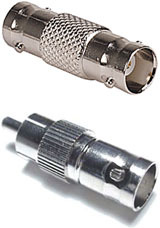 This allows a cable with a male BNC connector to be joined to an RCA cable with a female connector. Barrels are used for many other types of connections as well, including the popular jack and XLR (Cannon) connectors.